A Softball School that provides year round instruction in pitching, hitting, catching and fielding. Fastpitch softball organization dedicated to providing girls a place to learn, play and develop their softball skills. A traveling tournament organization. A directory indexing Fastpitch Softball and Softball related sites and resources. Includes college, professional, competitive, recreational, and business. The K-Zone offers fastpitch softball instruction in pitching, fielding, catching, and hitting. Fastpitch softball for girls ages 5 thru 18 who wish to partcipate in a recreational softball program located in Campbell, CA. Portal for softball: slowpitch, fastpitch, training tips, and the latest softball news. A softball search directory indexed by equipment, bats, and shopping. Girls fastpitch teams from Charlotte, North Carolina. 16U fastpitch team located in Omaha, Nebraska. Fastpitch teams from 10U thru 19U from Hampton, Virginia. Fastpitch teams from 10U thru 19U. Includes board listing and contact information. NAFA promotes and fosters mens and boys fastpitch softball. Girls fastpitch teams from Charlotte. 12 and under 'A' Girls fastpitch softball team from Broken Arrow, Oklahoma. Affiliated with Broken Arrow Girls Softball League, American Fastpitch Association and Amateur Softball Association. News, calendar, the team, photographs, links, and contacts. Portal to sites related to fastpitch softball, including tips and techniques, forums and chats, photos and want ads, coaching and practice resources. Is the fastpitch softball authority, located in Campbell, Ca with state-of-the-art pitching, fielding and batting facilities and an Olympic coaching staff unrivaled in expertise, unsurpassed in quality. A girls fastpitch organization based in the Gastonia and Charlotte, North Carolina region. 18U competitive travel fastpitch softball team based in Eau Claire, Wisconsin. A girls fastpitch organization based in the Gastonia and Charlotte regions. 14U Girls Fastpitch Softball team from New Bern, North Carolina. Softball organization that sponsors fastpitch tournaments and a world series. Girls softball organization from San Benito County, California. Girls fastpitch softball team from Huntersville, North Carolina. Calendar, schedule, practice, tournaments, fundraising, girls softball, and pictures. Girls softball organization serving Centreville, Clifton, and surrounding communities in Fairfax County, Virginia. Softball coaching tips directly from 3 successful softball coaches - Judi Garman, Rick Noren, and Kathy Veroni. Indoor training center offers year-round private and semi-private fastpitch pitching instruction for softball players. Based in Louisville, Kentucky. Covering the sport of softball on all levels, from Fastpitch to slowpltch, from seniors to youth. SWM has new equipment previws and all the latest tournament news. If the business hours of Shootingstar Fastpitch Softball in may vary on holidays like Valentine’s Day, Washington’s Birthday, St. Patrick’s Day, Easter, Easter eve and Mother’s day. We display standard opening hours and price ranges in our profile site. 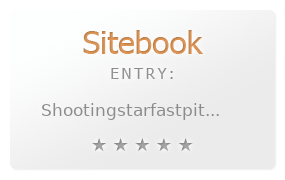 We recommend to check out shootingstarfastpitch.com/ for further information. You can also search for Alternatives for shootingstarfastpitch.com/ on our Review Site Sitebook.org All trademarks are the property of their respective owners. If we should delete this entry, please send us a short E-Mail.